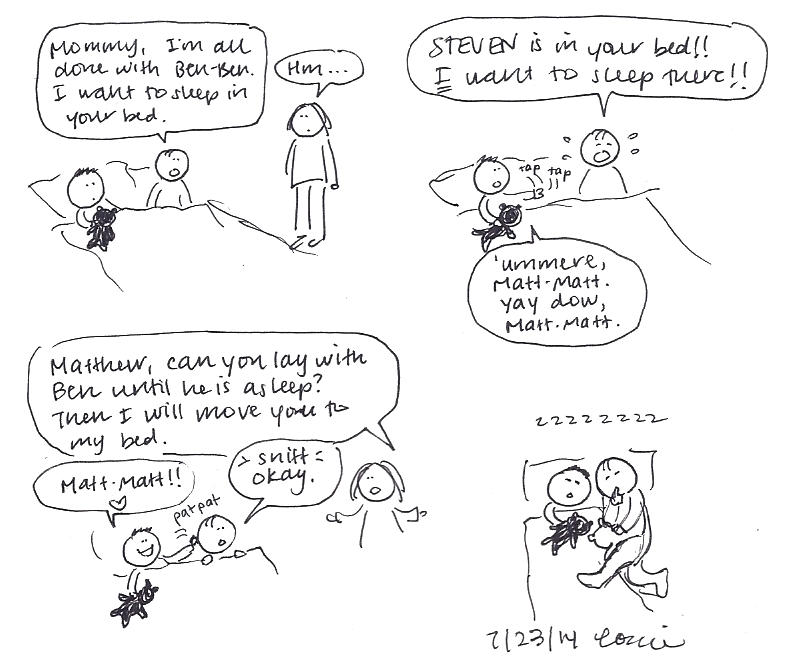 This happened the other day when Matthew was snuggling with Steve in bed. Matty can really run a joke into the ground sometimes. 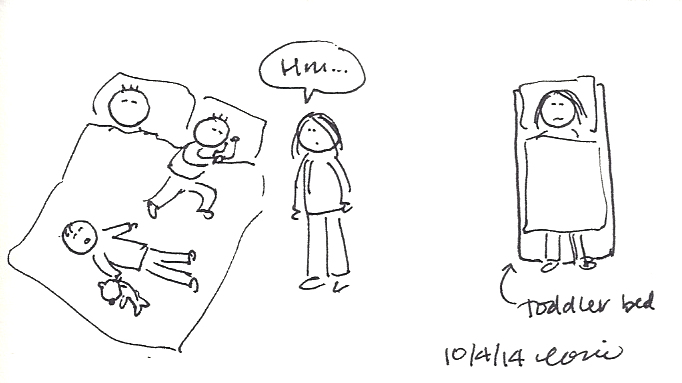 The other night, I discovered that I am a tad bit longer than a toddler bed. This is an example of something we need to know. With all the boys asleep, I cleaned up the kitchen, picked up the living room, read a few chapters of my book, and then decided to turn in around 10. 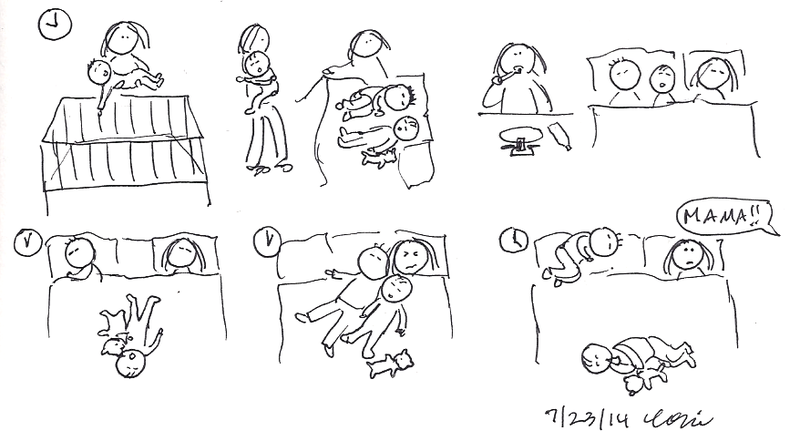 As promised, I moved Benjamin to his crib (he didn’t wake up), moved Matthew to my bed (he cracked his eyes open briefly and then settled his head down on my shoulder), laid him next to Steven on my bed, then brushed my teeth and went to bed. 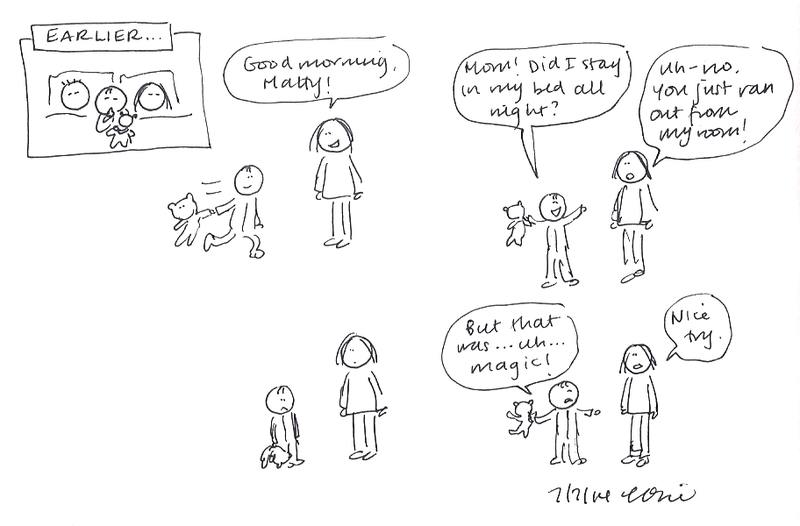 It was not to be a restful night of sleep for me, though, because Matthew is in a tossing-and-turning-all-over-the-bed phase. 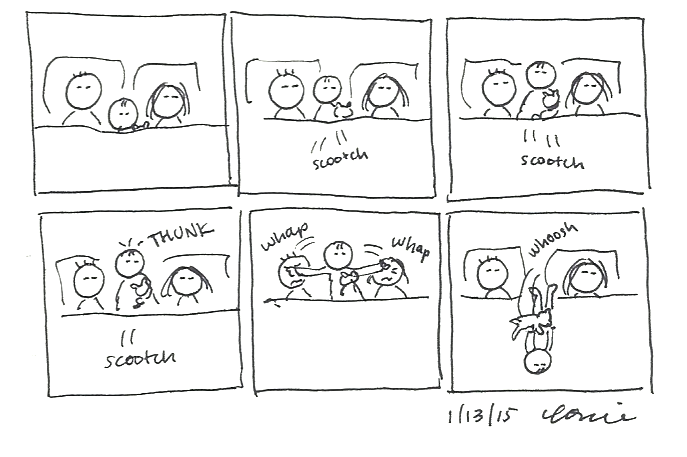 His hand would land on my nose, waking me up, or he would kick all the blankets off, and he finally ended up sleeping upside down on the bed for a while. At one point, his face was smashed into my chin, and since his feet were pushing against Steven, Steven ended up angling around so his head was pushing against my cheek, too. After dozing, waking, dozing, waking, I finally woke up for real at 5 am when I heard Benjamin calling me. We last left Matthew and Benjamin both in Matty’s bed, listening to music. 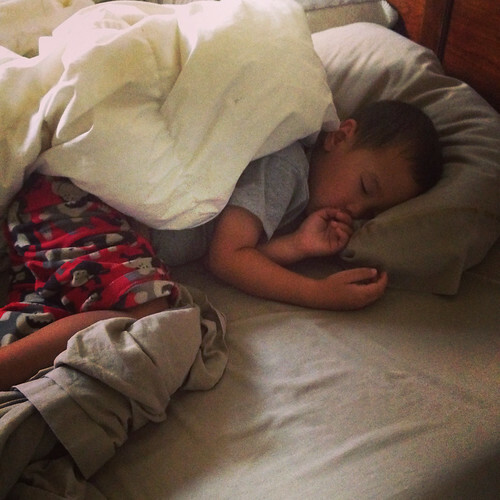 After the music CD ended, Matthew called me into the room, asking me to take Benjamin out of the bed. 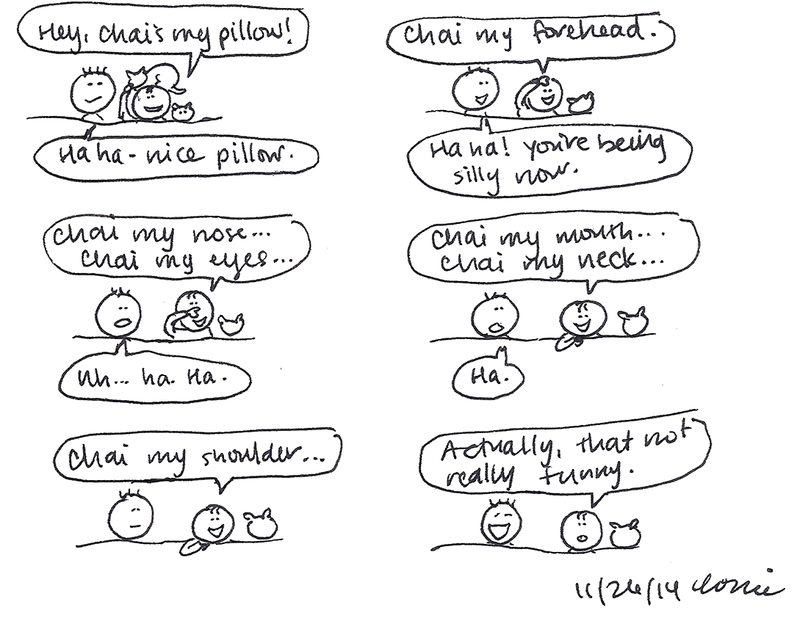 As he was talking to me, Benjamin kept tapping Matthew’s pillow, telling him to “Come here, Matt-Matt. Lay down, Matt-Matt.” I was able to calm Matthew down and get him to agree to lay more with Benjamin, because my primary concern was getting Benjamin to sleep (at this point it was getting close to 9 pm, an hour and a half past normal bedtime!). Of course, not two minutes passed before both boys were snuggling together, snoring quietly. After long snuggles with Benjamin, I finally got him settled in his crib, but as I drew the blanket up to his shoulders, his face wrinkled into the saddest looking expression I’ve ever seen him make, and as I put his baby and bunny next to him, tears began rolling down his cheeks and he started sobbing quietly and pathetically. Thinking he would settle down after a minute, I left the room, but his cries just got louder. 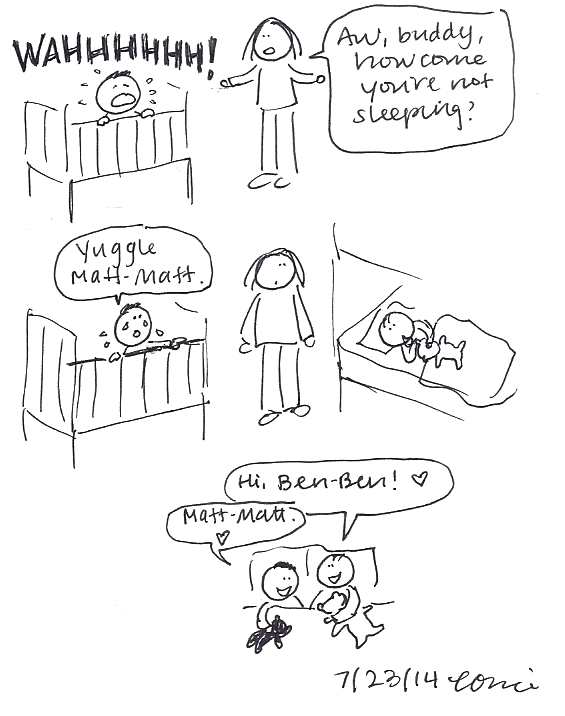 I went back in, and he clung to me tightly, and then he said sadly, “Yuggle Matt-Matt.” Some nights we all snuggle in Matthew’s bottom bunk together, so I asked Matthew if it was okay for Benjamin to lay down with him, and Matthew gladly scootched over and said sweetly, “Hi, Ben-Ben!” Then he put his arm around Benjamin, which absolutely melted my heart. And here’s a picture of the boy, below, taken this morning. No treat for him!